Nancy Jaramillo nee De la Fe and her family fled Cuba when she was 7. Her story is documented in the book HOLA AMERICA: Guts, Grit, Grind and Further Traits of a Successful American Immigrant. Her uncle had a friend who was executed by firing squad. As a result, her uncle feared for his life. Her father, who was a medical doctor, helped the injured men who fought against Castro's regime. The militia or 'milicianos' came to search their home on several occasions looking for hoarded medical supplies. Luckily, they never found any evidence and her dad was never taken. They fled with hardly any of their belongings, but the De La Fe family was happy to have their lives. When one hears about the small rations of food, murders and homes raided in communist Cuba, one seems to understand why in the wee hours of the morning on Nov. 26, Cuban-Americans took to the streets with pots and pans, their Cuban flags and bullhorns in celebration over the death of former Cuban dictator Fidel Castro. In Cuba, current president Raul Castro proclaimed a nine-day period of mourning, but for most exiles who fled communist Cuba, they have declared a time of jubilation in Miami – the city with the highest population of Cubans living off of the island. The Escobar family moved to Miami in 1961 to escape the regime. She has never been back since. As they were a wealthy family, the militia entered their home, too. They were harassed and many of their belongings were destroyed. Their farms, sugar mills and other businesses were seized by the government. “My grandfather, who was a doctor, but had been involved in politics, was threatened. I was only a 6-year-old when I left, but I recall hearing that a few of my uncles' friends (who were university students) had been killed. I do know some who were unjustly jailed for many years without a trial, and for really, no reason other than they disagreed with the regime,” said Gonzalez. For Gonzalez and other Cuban exiles which were threatened, imprisoned or lost everything in the revolution, Castro was a pariah, a blight on society, a cancer that could not be excised soon enough. Dr. Smith Joseph, Haitian mayor of North Miami, can understand what his fellow Cuban residents are feeling. “When Duvalier’s sons left Haiti, it was the best thing to happen to the people. It was as if they died. We’re talking about the same kind of regime. For Cubans who are living here who witnessed what happened to their people, murdered and imprisoned, these people are rehashing what happened to their families,” he said. Yet, Joseph claims that Castro is still hailed by many as a pillar in the political arena and that his system “pretty much worked” as Cuba boasts a 99 percent literacy rate and excellent health care. Angelina Arrington, a native of Los Angeles, who also visited Cuba in 2014 and got sick, claimed that she received fine, speedy medical care for $30 at a clinic designated only for foreigners in Havana. However, her Cuban host said that the clinic for natives is much different. “He told me that at the hospital they go to, one has to wait up to a day – sometimes- to receive treatment,” she said. Interestingly, this is an example of many of the incongruities within the system that Castro established. While students from across the Caribbean go to Cuba to study medicine and can return to their homelands to receive handsome earnings, doctors in Cuba with two specialties earn only $67 a month and an entry-level nurse, $25 a month, according to the Associated Press. Yvonne Latty is from Jamaica--Cuba's nearest neighbor. She now lives in central Florida but her daughter studied in Cuba. Latty said that not only did Jamaicans benefit from Cuba’s educational system, but while her daughter was attending college in Cuba, there were also students from Montserrat, St. Lucia, The Bahamas, Denmark and The Isle Of Man. In fact, the Latin American School of Medicine (ELAM) – 16 miles west of Havana - is one of the schools launched by Castro to boost the country’s international credentials. It has always been free to international students, training about 13,000 students every year. “I am unable to say anything negative about [Castro], especially since I did not live there. I can only say that I am grateful to him for what he has done for me and my family," Latty said. Joseph admits that Castro also regularly sent doctors to Haiti on international medical missions. “Aristide started relationships Castro and then Cuba sent doctors to Haiti. But, one has to ask, was it a masquerade, was the care adequate? Or was it being done to counteract the relationship that Haiti had with the U.S.?” said Joseph. Many other developing countries benefited from Cuba, not only in education and medical services, but also in trade, travel and tourism. Cuban cigars and rum are highly sought after and desired around the world. Indeed, despite the embargo, many Americans would travel to the Bahamas to purchase these goods. Additionally, disenfranchised people around the world were inspired by the Cuban revolution, particularly on the continent of Africa. 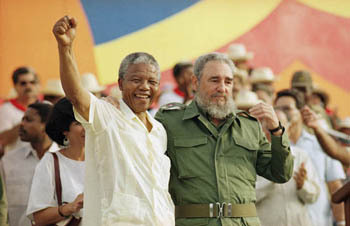 When Nelson Mandela visited Miami in June of 1990, he acknowledged support for Fidel Castro but was criticized by many leaders in the Cuban political community, including Xavier Suarez then mayor of Miami-Dade county. For Angolans in South Florida, they remember the more than 36,000 Cuban soldiers who fought alongside and died with the Popular Movement For The Liberation Of Angola in the 1970s and 1980s. However, according to the book written by Juan Reinaldo Sanchez, who served as a bodyguard for the former Cuban leader for 17 years, Cuba simply wanted to control the natural resources of Angola. Two-thirds of the population in Cuba is Black – something you would never know by surveying the immigrant community in South Florida. Gonzalez, an Afro-Cuban who is chief of staff for now Miami-Dade Commissioner Xavier Suarez, explained the rationale behind this. Erica Bowen, a native Californian who has studied danza moderna technique in Cuba since the 1990s and started a dance travel and tourism group called AMP Cuba in 2009, said that now one cannot boil down the issues in Cuba to issues of race. “Cuba is such a complex country. Fidel being a leader for so long is complex. All of the ideas that he talked about were just ideas. The actual application of it did happen in Cuba but a lot did not happen,” she said. 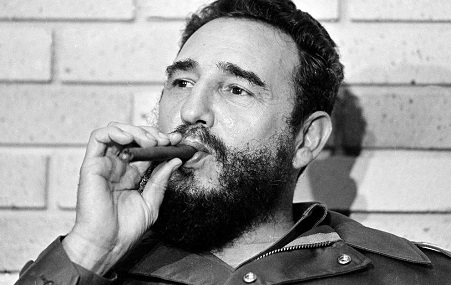 But, now that the cigar-smoking, bearded revolutionary from the Sierra Maestra mountains is gone, will there be change? “That was one chapter. You still have the chapter of his brother and the 10 million Cubans who need to be empowered to liberate their minds from the oppression of the regime,” said Henry Crespo, first-generation Black Cuban American and president of the Democratic Black Caucus of Florida.